Arctic Green slate is identifiable because it is one of the few light green/grey slates in the world. This popular slate features varying shades of ocean green colours and is of exceptional quality. It has a grainy surface texture and is highly versatile; It is a dense stone suitable for all external and internal floor and wall applications. A measure of the environmental credentials of a building product is the involvement by man and process up to the point where it is fixed to a building. On that basis this slate is a clear winner. These display pieces were photographed dry with no sealant. The Hotel Steyne overlooking Manly Beach recently refurbished their second level, to include a new Chinese Restaurant and terrace. 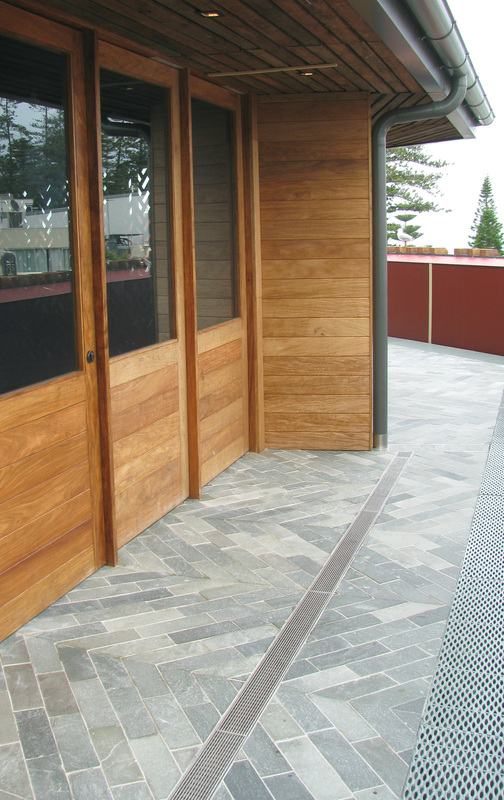 The images here illustrate the design synergies between slate and timber that have been used to create a maritime theme using recycled wharf hardwood. The FIFO friends perched on the ledge lend support to the designer's concept for this beautiful outdoor verandah. Of interest is the way the slate tiles have been used. A diagonal pattern of 300x100mm slate strips have been used down the terrace thoroughfare and 300x300mm slates used within the horseshoe shaped hardwood benches. New Arctic Green slate was laid in the bathroom of an 1840s heritage cottage at Berrima to match the same slate laid 25 years ago in the kitchen. This image showcases how Arctic Green slate has been used in one of the heritage restrooms at the Red Lantern restaurant in Darlinghurst. A gloss sealer was applied which has darkened the colour. 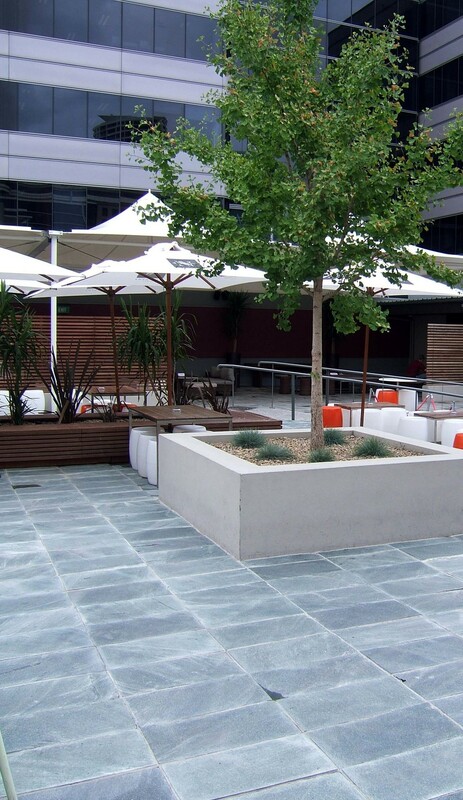 Arctic Green slate was used by Onsite Design on the floor of the Eastern Hotel restaurant in Bondi Junction. Note that the slate has been laid in checker board fashion. Surface sealing is suggested for internal and external food areas but may be left natural for all other applications. Surface or topical sealants (eg Aqua Mix's Seal & Finish Low-Sheen or High Gloss Sealer) will result in either a low sheen or a gloss finish depending on the outcome desired and the sealant used. An enhanced colour with a mat finish can be achieved using Aqua Mix Enrich 'N' Seal which is a penetrating sealant.